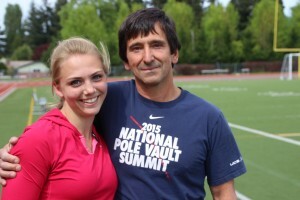 Anna Chartrey said her coach Dan McGuinn helped her break the school record in the pole vault. 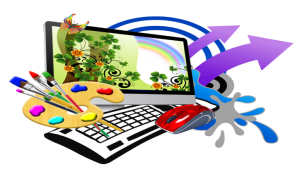 It was the inevitable moment of truth, the moment that separates the doers from the dreaders. 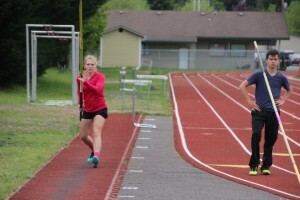 Three years ago, Anna Chartrey, as a freshman on Tumwater High School’s track team, sprinted down the pole vault approach, toting the long, cumbersome pole. And without hesitation, she planted the pole, lifting her off the ground. She faced the challenge without wavering. There are certain characteristics about a successful pole vaulter. There’s the physical capabilities and there’s the bungie jumping kind of personality – the risk taker. And it’s that unique combination of physical talent and ignoring the fear factor that makes Chartrey so special. In Tumwater’s first meet of the season, Chartrey, who is now a senior, broke the school’s pole vault record, clearing 11-foot-6. In the next meet, she broke the record again, making 11’8″. From that first attempt at pole vaulting her freshman year, Chartrey was drawn to the event. 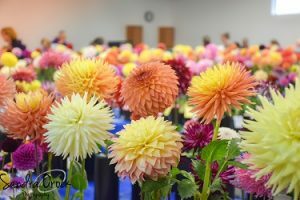 She said helping her overcome that fear factor was McGuinn, the perpetual encourager who is quick with praise and a critique. It’s those encouraging words that kept her pole vaulting. 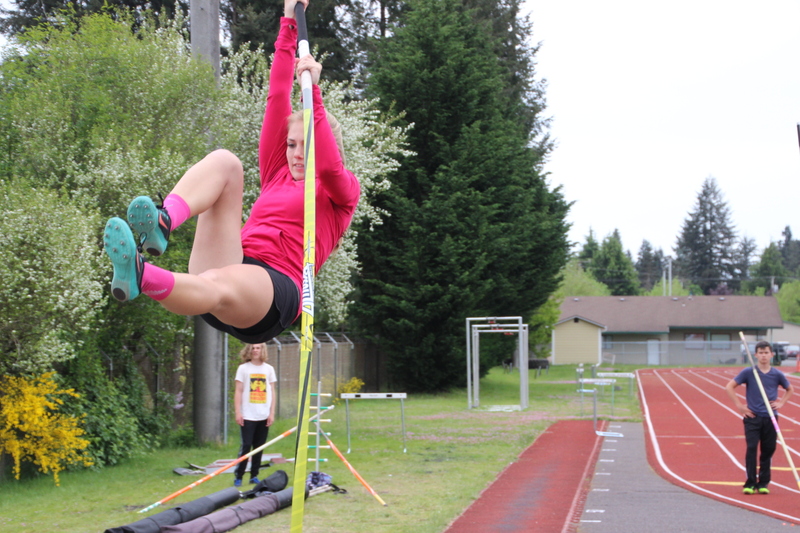 Tumwater’s Anna Chartrey begins the run down the pole vault approach at a recent practice. It’s a special bond between coach and athlete. Chartrey overcame her fear of pole vaulting with trust. Chartrey wasn’t an overnight meet winner. It took some time. As a freshman, she cleared 7 feet and then by the end of the season at district she made 10 feet. Last year, she had the school record in sight but just missed several times. Now, she’s got the second best vault in the state for 2A and she’s hoping for a state title. But one thing Chartrey isn’t dreaming about is vaulting in college. She’ll attend Portland State University next school year and she’s not planning on turning out for track. That might change if she continues to up her heights in the pole vault. Clearing 12 feet could bring some scholarship offers. 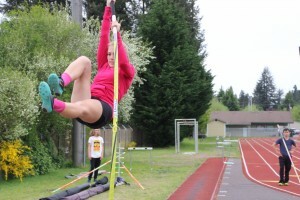 Anna Chartrey works on her pole vault technique at a recent practice. Chartrey is the complete package when it comes to pole vaulting. Chartrey has had some high anxiety moments vaulting. Last year, she came off her plant awkward and missed the mat on her landing. Fortunately, her coach was there to catch her. “I guess I need to wear more padding,” McGuinn said with a laugh. Fortunately, there was no injury – to coach or vaulter. And there was no lingering fear factor for Chartrey. But that thought “I could get hurt” is always there, not far beneath the surface. However, proficiency quiets the fear. 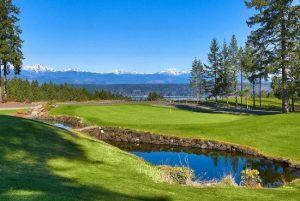 Anna Chatrey plans to attend Portland State University after graduating from Tumwater High School. Through Chartrey’s chase for school records, there’s been two supportive voices – her parents, Brandon and Amy Chartrey. She never had to convince her parents it was okay to pole vault. Chartrey’s success pole vaulting isn’t an accident. She commits to track year around. She doesn’t participate in any other sport. 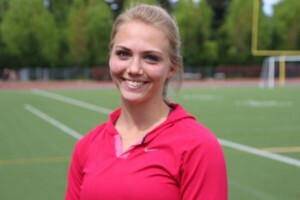 During the summer, she’ll again compete in the state decathlon meet.